Ginger lilies are disgustingly straightforward to grow, which is satisfying when one considers their fabulously exotic appearance. 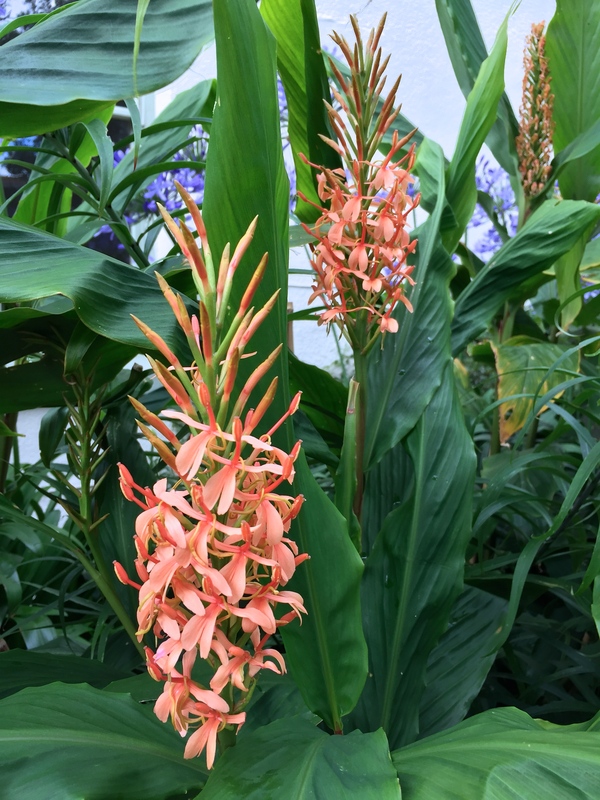 Hardy gingers from the genus Hedychium produce lush foliage on robust stems, topped by clusters of fragrant flowers during the summer and autumn months. Ginger lilies are not thwarted by our typically cool, damp summers; these are the conditions that most species are accustomed to in the wild. In fact, too much heat or sun and the leaves will roll up to reduce water loss. All these showy plants demand is copious water (rarely a problem in the UK), a rich soil, regular feeding and a generous mulch in winter. I grow mine in large, black, plastic tubs which are slung unceremoniously in the cellar once the thick, fibrous stems turn yellow in autumn. When they are ready, they snap off effortlessly at the base, emitting a warming, gingery scent. Well rested, the rhizomes are returned to the light in April or May when thick, pink shoots start to appear, often forcing out the sides of the pot with their incredible strength. I have refrained from adding to my collection of ginger lilies this year for fear of them taking over the entire garden. At the moment I have H. ‘Stephen’, H. ‘Tara’, H. gardnerianum, H. yunnanense and today’s subject, H. ‘Sorung’. This lovely plant was discovered by the late Edward Needham, a renowned plant collector, 7900 ft above sea level in Hongu Khola valley, Eastern Nepal. If you need help imagining what that landscape looks like, see the image below taken by Sergey Pashko. Compared to H. ‘Stephen’, to which ‘Sorung’ is closely related, the flowers are more of a soft coral shade, or, if I were being vulgar, the colour of a well cooked prawn. Fortunately they smell rather more attractive than any shellfish I know, emitting that rich, intoxicating scent that many people would recognise as the Ginger Lily of Molton Brown, Jo Malone and other perfumers. 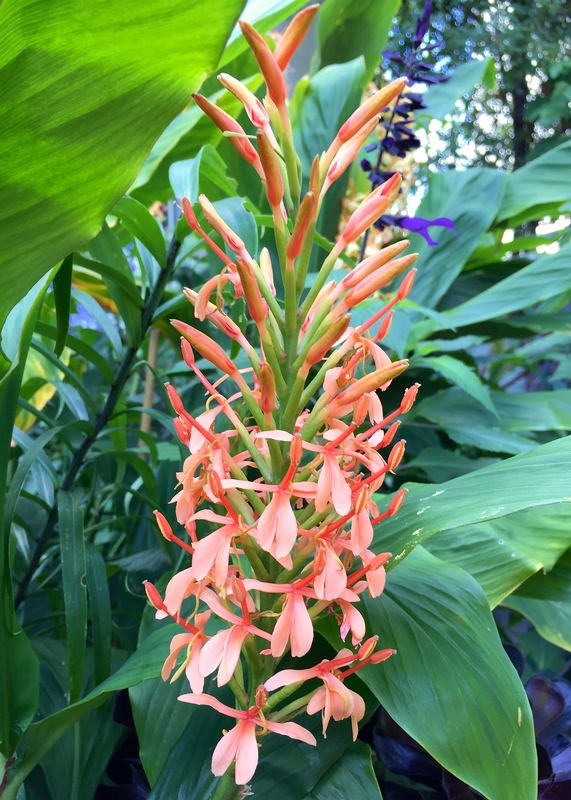 The essential oil they use is derived from Hedychium spicatum, which is itself another great root-hardy ginger for gardens in the UK. I’ve not met a ginger lily yet that does not smell gorgeous …. but only after dark. Quite why ginger lilies are not more commonly grown in the UK mystifies me. They are at least as hardy as dahlias and more tolerant of cool, wet conditions, and of shade. True, their flowering period is shorter, but I find if gingers are well cared for they produce a second flush of spikes after the first are spent. And dahlias possess no fragrance at all. 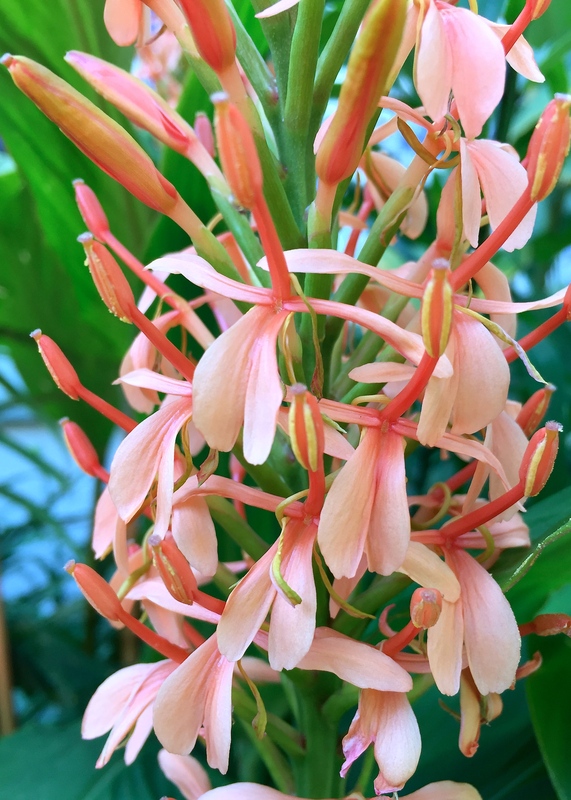 Flower colours range from white through cream, yellow, orange, coral and red (belonging to the fabulously flambuoyant Hedychium greenii). Good sources of ginger lilies in the UK include Jungle Seeds and Pan Global Plants. Now that it’s dark, I’m off into the garden to fill my lungs with pure ginger lily before bedtime: a scent for the soul and for sweet dreams. TFG. You would love the scent Helen. Ginger and ginger lily…are they relatives? The colour does look like cooked prawns! They are beautiful. They sound interesting, never grown them, only ginger root for the pot. I’ve ordered a few packets from Jungle Seeds, I’ll let you know of my success, or failure! I’ve received my order from Jungle Seeds, 5 varieties; Hedychium coronarium & spicatum, Cautleya gracilis & spicata plus Caulokaempferia sikkimensis – I hope they’re easier to grow than spell! I will split these packs of ten seeds each with a neighbour, she’s a real gardener, and hope for success between us. Do we sow them now? Sow seeds indoors as soon as possible. Prior to sowing soak seed for 2 hours in warm water. If seed swells sow immediately, if not prick the seed gently with a pin and soak again. Sow 1-2mm deep into moist, well-drained seed compost. Place in a propagator. Ideal temp. 21-25°C. Keep moist and in bright light. Germination takes 20-25 days approx. Transplant seedlings when large enough to handle to 8cm pots and grow on. If planting out acclimatise for 10-15 days after danger of frost has passed. Thanks a lot for your advice, will get on with the sowing this weekend and let you know how it goes in 2 or 3 weeks. What a beauty! Where did you get it from Dan? This one was from Jungle Seeds, who confusingly also sell plants. I can recommend them. The plants have always been a great size and packed splendidly. Not remotely surprised Gill. Sorung is really pretty. I am a bit in love with these prawn colours at the moment. I have some Watsonias that I could gaze at for hours. They’re an almost luminous coral pink. Delicious. Do try and get hold of a piece, it’s a very attractive coral colour. Mine is slowly filling a large pot.